Tube ice is thick and transparent with long storage period, it isn't likely to melt in a short time. Which has external diameter 22mm, 29mm, 35mm, COLDMAX also can customerized for you. Length ranging from 25-50mm, and the inner hole diameter can be adjusted according to ice-making time. 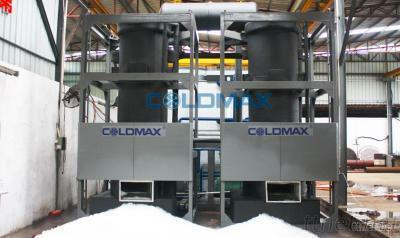 COLDMAX adopt special recycling ice making way to get rid of the impurities in water, the ice appears to be tasteless, sanitary, transparent, good-looking, shape of unity, completely conforms to food standards. Which can be directly eaten, for human consumption. 1. Freezing drinks, mix wines. Cool foodstuffs, make ice pastries and keep fresh. 2. Widely used in hotel, bar, KTV, restaurant, catering, supemarket, ballroom, etc. Use hot Freon gas to make ice harvest fast each freezing cycle around 20mins to 30mins. After the ice is off, the water of low temperature is used for ice-making, saving energy consumption and increasing the volume of production of ice. With the unique water distributive pan and air mouth, the water can evenly flow on the tube wall of the evaporator spirally, so it improves the efficiency of heat transfer.